Introduction: We first met Tyler Ream of TyLure in November of 2008 at the annual Angler’s Marine Bass-A-Thon. At the show, we were impressed by the fact that despite the number of different lures he has to offer, Tyler checks each individual bait to make sure it swims straight and true so they are complete and ready to go out of the box. Add to this fact that all his baits are available at a very reasonable price and it’s difficult to not want to see what they’re all about. 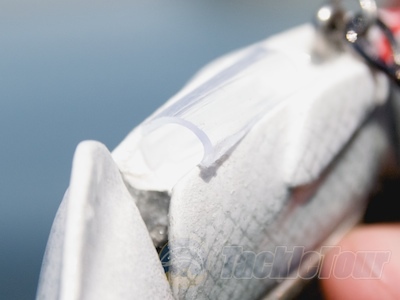 Today we take a look at one of his Kicker Series of baits, the five inch (5”) Kicker Shad. Introducing the TyLure Kicker Shad. 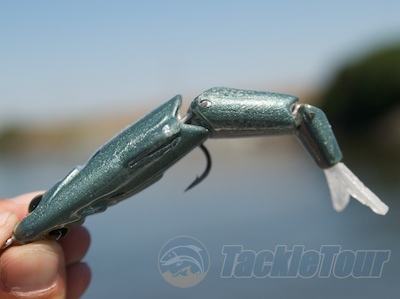 Impressions: The TyLure Kicker Shad is an interesting little bait. First off, as with all TyLure products, each bait is hand made and hand painted by Tyler Ream himself. Measuring in at five inches, the Kicker Shad is part of his new series of baits that features a hook keeper system that holds the hook as close to the body of the lure as possible to present a more realistic profile to the fish. Once a fish takes the bait, the hook pulls free of its holder and you’re free to fight the fish as you would at any other time. This three-piece, bite sized morsel has good flexibility towards the back of the bait. Implementation of this system is rather simple. Tyler Ream simply uses a small tube cut along its length and securely adhered to the body of the lure. To use this system, just flip the tube open, slide the shank of the hook inside, close the tube and voila! 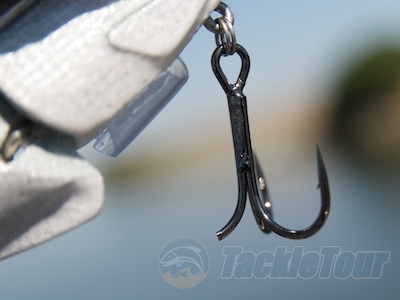 The hook is held in place until a fish strike! Simple and effective – just like most well designed and thought out innovations. Field Tests: Though I’m not usually a fan of these smaller “swimbaits”, the great thing about them and of course the TyLure Kicker Shad, is you can fish them on everyday bass tackle. 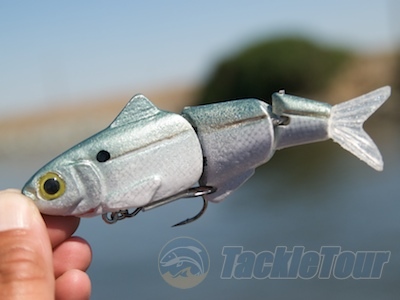 In fact, for these shad imitators, you can even fish them on cranking sticks! As such, I was able to fish the Kicker Shad all through our Crankbait Rod Wars battles with little to no difficulty. Until such time that a fish strikes. 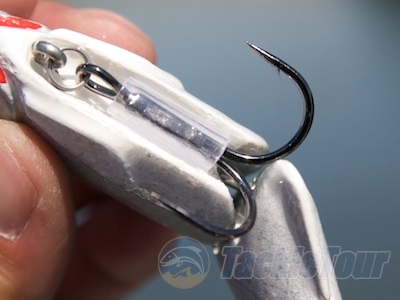 Casting: Thanks to the TyLure “hook-slot-tube” and the Kicker Shad’s single hook this bait is immune to fouling during the cast and as a result, makes a very effective and efficient search tool. Simply fire off this one and a half ounce lure to target after target until you find the fish. Thanks to its compact size this is a relatively easy bait to deliver accurately on just about any style of cast. This is accomplished, literally, with a slotted tube on the belly of the bait.